After months of warmer to much warmer than average temperatures in the area over the past several weeks to months, the weather will finally turn more seasonable this week for most of Colorado. 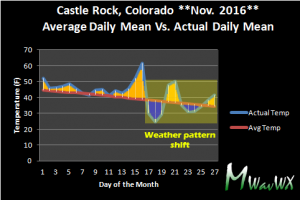 The Castle Rock and Palmer Divide area will see high temperatures generally in the upper 30’s and low 40’s with nighttime temperatures turning much colder and reaching the teens most nights. 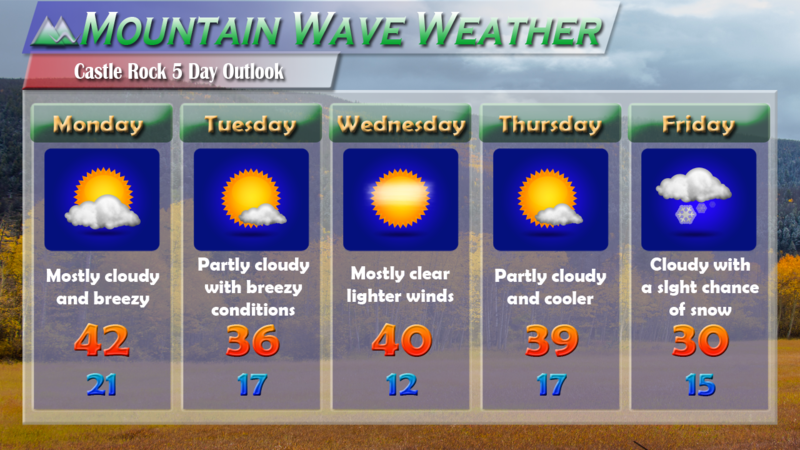 The caveat here is that while we will see the colder temperatures it will generally be a bit windy on some days and the chances for rain and snow are quite low for most of us East of the divide throughout the week. The moisture is badly needed for us as we still continue with drought conditions for most of the areas in and around Castle Rock. Further windy and dry conditions will keep fire danger relatively high, even in spite of the cooler temperatures. 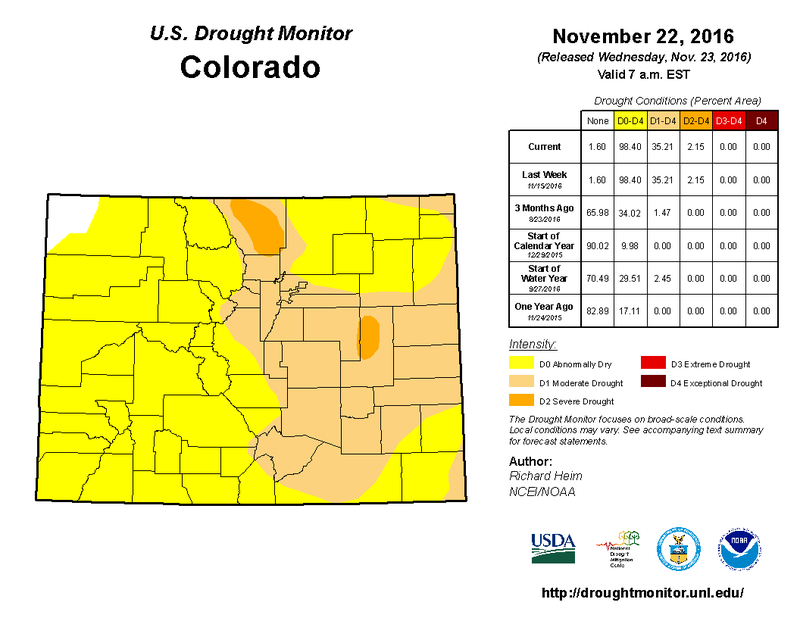 U.S. Drought Monitor still shows all of Douglas County in a Moderate Drought status. The good news is that the weather pattern seems to have shifted, at least in the short term and with the colder shots of air, it is sometimes just a matter of time before the more active storm track brings better moisture to us in Eastern Colorado. 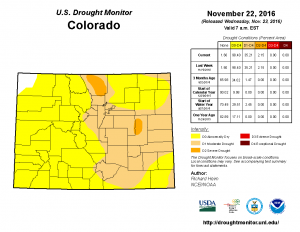 Before we get too carried away with dreams of snow in our future, we must keep in mind that La Nina weather patterns are typically dry and windy for the front range of Colorado. With that said, we will need to keep an eye on the overall storm track, while it looks like the cooler air will be making it into Colorado more often for the foreseeable future; nothing I see right now is pointing us to a wetter storm track for Eastern Colorado. At least not in the next 7-10 days. Sure we may get a quick glancing blow and a bit of snow here and there, but nothing is screaming out “big winter snowstorm” for us anytime soon. After a very warm and dry start to the ski season in the hills, the weather pattern this week will benefit our ski resorts quite a bit. The storm track is moving storms in from the Northwest, this doesn’t usually bring the Denver area much snow but the mountains benefit quite a bit from this type of storm track. 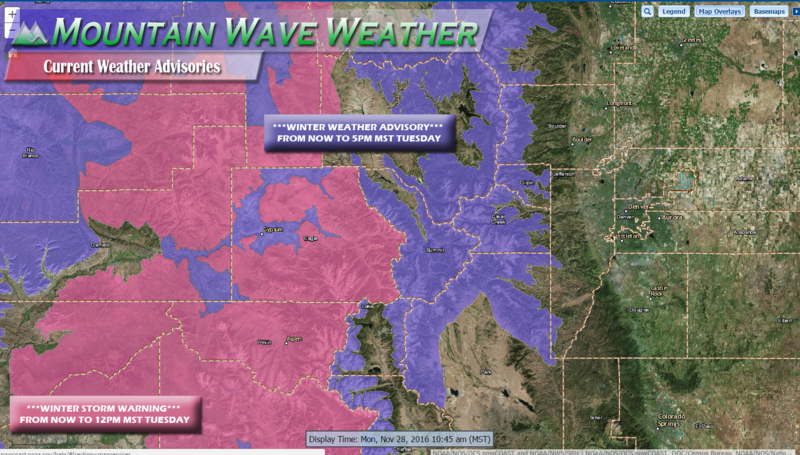 In fact, heavy snow and windy conditions will make travel to the high country tricky this week. So keep that in mind if you are heading up that way! * TIMING...PERIODS OF SNOW WILL CONTINUE THROUGH TONIGHT. EXPECTED TO SEE WIND GUSTS TO AROUND 45 MPH ABOVE TIMBERLINE. SNOW AND IN AREAS OF BLOWING SNOW. SNOWPACKED ROADS AND POOR VISIBILITY. STORM TOTAL OF 10 TO 16 INCHES WITH LOCALLY HIGHER AMOUNTS. * WINDS...NORTHWEST 10 TO 20 MPH WITH GUSTS UP TO 40 MPH. TRAVEL DIFFICULT ESPECIALLY OVER MOUNTAIN PASSES. As always I’ll be keeping an eye on the weather throughout the week and will have updates if there are any changes to the forecast or we see anything interesting coming our way. Hope everyone had a great Holiday!